This has pretty much nothing to do with any storyline. It's pure filler. Furthermore, it's fairly decent filler. I like that panel of the two people watching Spider-Man swinging by. You hardly ever get to see that, I think. TIL: The whole thing is nice, but that NEXT box? It fills me with (false) hope. Hold on a second, your favorite wife? Your FAVORITE wife? When did you become a polygamist, Mister Parker? Furthermore, who are your other wives? I mean, we had Dara Dorset claiming to be your wife a while ago, but she admitted she was lying. Unless you've got Gwen Stacy in a closet somewhere, I'd suggest using a different term of endearment. Ah, and you're a fool: beware the ellipses of Lopez! TIL: That odd painting behind the television. Okay, so he's admitting to not taking the photos. That's good. I wonder when something will happen. Soon, I hope. TIL: The little byline box... I like how it's casting a shadow. So this is a supposedly comical epilogue and not the beginning of a new story arc. That is wonderful. Simply wonderful. I would also think that even Jonah would rather be home in bed with the flu that having the flu at the office. Also, check out Choose Your Own Blogventure, if you please! It has Land Captain in it! You remember Land Captain, don't you? TIL: The fact that Peter seems to be channeling his inner leprechaun. I had forgotten all about the direct-to-DVD and off-Broadway thing. Weren't those from the Krandis storyline? Back in January through March? I think it is. Also, the pair discussing Peter's secret identity in crowded places is starting to become a real sore point with this strip. The Next box is somewhat promising. By Wednesday, I predict that any promise it has will be broken and we'll be exposed to three months of shoddiness. TIL: The art is decent. I also think that restaurant is called Ojimbo's. That's sort of neat. It wasn't so much a battle, as a mid-air game of chicken. Perhaps, at best, some bizarre sort of joust. I also wonder what all the spectators think of Mary Jane whispering things to Spider-Man. Not like those two have caused enough trouble for themselves with the whole secret identity thing already. TIL: The fact that Mary Jane is basically committing fraud. ...ah, also, there's now a donate button. I don't expect anyone to use it, but it's there, just in case. I totally called this. Odd how the background sort of turns on and off, though, and Spider-Man loses his lower half in the third panel. TIL: Spider-Man's pose in panel three. It looks like he's doing jazz hands, or maybe that thing with the mime trapped in a box. Spider-Man and Jonah Jameson: Best Friends Forever? Why exactly are Jameson and Spider-Man hanging out together? The two are never on the best of terms to begin with, and while I know that Spider-Man just saved Jonah's life, it doesn't seem like the two could get along well enough to stand around spouting exposition or talking about hugs from the Hulk. How much do you want to bet that Mary Jane managed to snap some pictures of the... well, of the Vulture trying to ram Spider-Man off a helicopter, followed by Spider-Man, Jonah, and the Vulture falling slowly towards their doom. TIL: The Vulture being led away to a police car. It just strikes me as rather absurd, for some reason. Maria Lopez looks like a Romulan, doesn't she? Also, it looks like the next storyline will have a healthy amount of Jameson trying to win Maria Lopez, and being his typical arrogant self while doing so. This pretty much ensures we're getting a guy in a suit next time. Will it be the Kingpin, or Hammerhead? Probably not, which is a pity. 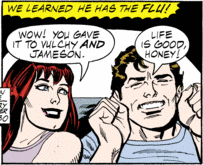 TIL: Jameson acting like a lovesick teenager. The third panel here fills me with mirth because of so many ways you can interpret it. Well, two ways that I see, at least. The first way is that there's no Hulk... wait. Spider-Man has fought the Hulk before, in this strip. Never mind, then, this whole post is now ruined because of my on-again/off-again memory. I guess it just means that no one, anywhere, has any idea where Spider-Man was going with the Hulk comment. TIL: Panel three, of course, and Spider-Man's frank admission that even he had no idea what he was talking about. 1) I can only pick one panel from each strip, but not every strip. 2) The panel, therefore, has to work out of context. #5- 08/11/2008 As you can see, it's Spider-Man. Except he's upside down with speed-lines and questionable perspective. Mainly the upside down, thing, though. That's what got me. #4- 08/12/2008 Spider-Man is being flippant, which is always good, and I love the sight of Jameson clinging to the top of that building. #3- 08/10/2008 Once again, flippant Spider-Man. 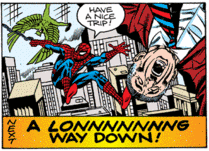 The Vulture's pose is really silly, and we see Jameson falling in the foreground with his mouth agape with terror. This is also a sight I treasure. #1- 08/15/2008 Spider-Man back-handing the Vulture and talking smack. No one is upside down, and it does not feature Jameson falling, but this panel was such a pleasant surprise that it filled me with a warm fuzzy feeling when I first saw it, and continues to brighten my day. The panel of the week will take up residence in the top corner, passing that honor from the panel which previously held it for several months to this week's winner. Good show, panels. Good show. Previous winners will be kept here. Why is it that, whenever anyone else falls, Spider-Man catches them flawlessly and no harm is done to them at all, yet when Gwen Stacy fell, her neck got snapped? Yes, I know that it was due to the impact or something like that, but honestly, catching Jameson like that would at least give the poor guy whiplash, if not a broken spine and shattered ribs, yet they'll land and Jameson will walk away as fine as can be. I guess the rules of the universe changed for that one crucial moment to allow Gwen Stacy to die, just to mess with Spider-Man. Which actually fits the character, more or less. 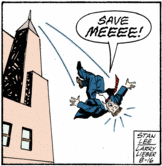 TIL: Jameson falling off the building. I had an idea earlier today, which will be implemented on Sunday. Just a heads-up. 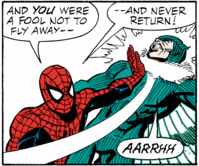 The Vulture really is just a costumed thug, isn't he? Any other villain would probably decide, "Hey, Spider-Man saved me. I'll still escape while he goes off to rescue Jameson, but I won't try to beat him up." If I was Spider-Man, I would just turn around and punch the Vulture in the face. Also, where's the Spider-Sense? TIL: The random bit of people and scenery in panel three. Weird. I've made my apologies, now let's do some comicky stuff. Ten days worth of it! With the return of Thing I Liked! 08/04: You know, wouldn't Jameson's arm be yanked out of its socket? He's an old newspaper guy, after all, his joints aren't what they used to be. TIL: Jameson's pleading in panel two. 08/05: I'm not a man who knows a lot about helicopters, but I do know a bit about Spider-Man, and the man probably weighs under two hundred pounds. Would an extra person of that size have any visible effect on a helicopter? TIL: Speed lines in panel two. You can't go wrong with speed-lines. 08/06: Flying man with hostage versus helicopter: I think we all know who the winner in that confrontation would be. 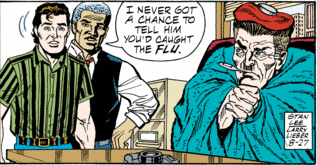 TIL: Once again, Jameson's pleading in panel two. Huh... my local paper started carrying the strip a bit ago, so I've read each of these the day they came out. I must say, though, that when you read them all together like this it does a pretty nifty job with suspense. Perhaps this week is just a fluke, though, as I doubt anything could make the Pestilent Parker bit be interesting. Still have to wonder why the Vulture is using chemicals instead of his supposedly razor-sharp wings. TIL: The alternating point of view is pretty keen. 08/08: The Vulture does something many villains never do: learn. TIL: Tiny Jameson in panel one. I know it's perspective, but it's still rather silly to see. 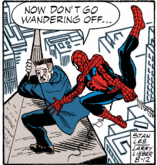 That is one cruddy anti-gravity device if you can clog it just with webbing. At the high altitude the Vulture operates at, you would think that frost would sort of build up a bit, and he'd compensate for this somehow. This would also take care of the thin veneer of webbing Spider-Man is putting on there. TIL: Panel two is funny, I think. 08/10: I like how this makes Spider-Man out to be the world's biggest jerk. "Oh, so I can only save one of you? Nah, not choosing. See you later!" TIL: Jameson in the final panel. 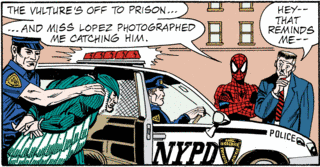 08/11: Now, Spider-Man is being a bit less of a jerk by only letting the super-criminal die. While I could argue that we both know he won't, I remember when the Scorpion was in the strip and Spider-Man sort of let him drown. Will we have a repeat of passive homicide? TIL: Jameson continues to be a highlight of this falling adventure. Jameson shouldn't be so surprised: Spider-Man has saved him hundreds of times before. TIL: Jameson clinging to the top of that building. Magnificent. Huh. Sort of underwhelming, really. TIL: Speed lines, and the fact that the Vulture looks like he's clawing at the air. So, what happened was that the phone line got connected all right. It got connected pretty much right away, actually, and considering how the Internet and phone line are part of a package deal, I assumed, "Thank god! Now I can update everything and whatnot!" I spent the Monday after I moved on the phone with tech support, and the final verdict was that my old modem was busted, and I had to get a new one. No big deal, kind of, so I went out and bought a brand new modem, with wireless and everything, and I brought it home and hooked it up and looked down at its blinking red light, perplexed and rather angry. "What devilry is this?" I exclaimed, and I spent the better portion of a night trying to figure it out. A FEW BUSINESS DAYS, THAT IS! So I waited. Plans were made to go to a library and at least let everyone know what was going on and putting the blog in the hands of a retainer for a few days, something I remembered several days into this whole fiasco, but every single plan was shot down like one of those "Duck Hunt" ducks: with a light gun held up to the television screen. Actually, just by people being really inconsiderate to my friends and myself. Stymied at every turn, and all that. I did try to put up a post from my cell phone, but it refused to send. What's important now is that my bit of the Internet is up and running, and now it would seem I've got me some wireless connection. What does this mean for you? I have no idea. I'm just pleased with the wireless. Anyway, I'll get the backlog of strips up as soon as I can. Right now, I've got twelve minutes, so we'll see what I can get done. Spider-Man makes three? Who are they counting? You have the Vulture, Jonah, Maria Lopez, and her pilot, and then Spider-Man which makes five. Also, I think the NEXT box is lying and no one is going to die in the sky. On a side note, I'm moving today, but I've been assured that I'll be able to Internet again pretty promptly, so I shouldn't miss an update. For a while, I was doing a little thing called Thing I Liked, or TIL, in which I would choose something I liked from each strip each day. A sort of silver lining to the cloud, if you will. I stopped doing it a while ago (late January, actually) and I forgot to start doing it again. I'd like to do it again, but I'll leave my fate up to you folks. So there's a poll up now, just in in Choose Your Own Blogventure, except instead of choosing what exciting antics happen next, you'll choosing whether or not I do TIL. I'm sort of ashamed that I turned this into a plug for Choose Your Own Blogventure, but seriously, you should be reading that. Please. At least I didn't plug my other two things (PC/MS and Third Attempt!, if you were wondering) so... wait. Well, vote on whether or not I should do TIL, and then perhaps go look at my other stuff which is all TIL. See what I did there? I've passed some sort of shame threshold. I'm also ranting because it's nearly 5AM and I am tired. So I shall sleep now. Remember to vote and read stuff! Oh jeez. 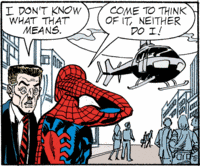 We all know what happens when Spider-Man web-lines a helicopter. (See here if you don't.) He's going to smash the helicopter into the Vulture, isn't he? This may be something to see. 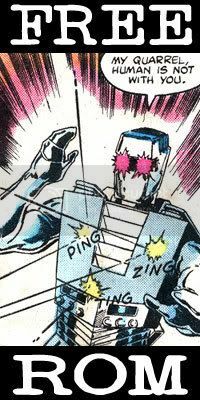 Spider-Man's spider-sense is slowly becoming a deus ex machina sense, rather than something to warn him of impending danger. In any case, it's Friday, putting my Spider-prediction of him going off as Spider-Man on Tuesday off by a few days. Whether or not Spider-Man is early or late is a mystery, as I neglected to put down which Tuesday. Next time I'll remember.